The clock is ticking but we still want to share some exhibitor profiles with you so let us introduce another stunning wedding venue – Killashee House Hotel. Killashee House Hotel is a beautiful 4 star luxury hotel located just 30 kilometers from Dublin city just outside the charming, bustling Naas Town. Set amidst over 280 acres of historic and intriguing gardens, walkways and parkland the Estate offers much to do for outdoor enthusiasts and the gymnasium, 25 metre pool, sauna, steam room and restaurants and bars for the indoor enthusiasts! The Original House is the perfect choice for an intimate reception at Killashee House Hotel. Catering for up to 99 guests, this former Victorian Hunting Lodge is over 150 years old, offers a Private Entrance, and includes a Banqueting Hall, several Ante-rooms with original features and fireplaces, as well as 12 Bedroom Suites filled with old world charm and antiques. Also reserved for your exclusive use is the beautiful new gated ‘Butterfly Garden’ in aid of DEBRA Ireland. This garden, done in a Victorian style, features a stone and iron Pergola, a Water Fountain, Statuary and an ever changing display of colour with our seasonal plantings. It is simply a stunning backdrop to this exquisite venue. 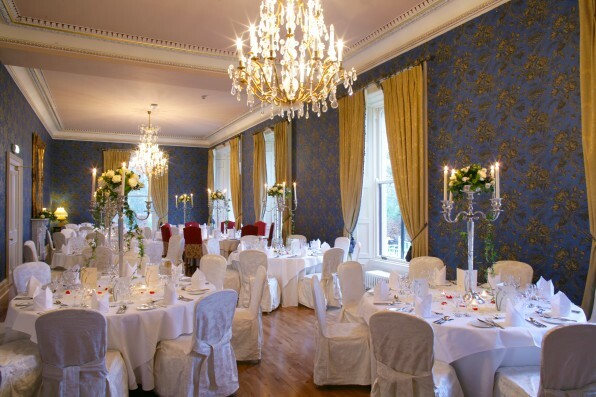 Killashee House also boasts a magnificent ballroom, The Thompson Suite, where weddings over 100 guests can be catered for in a beautifully appointed space with its own separate dance floor and bar area ensuring the utmost comfort for you and your guests. Katie & Lisa from the Wedding Team look forward to meeting you and discussing how Killashee will be the perfect fit for your Special Day so be sure to stop by to say hello. Posted on October 26, 2012 | Categories: Exhibitors, News.